Developers have submitted details for approval by North Kesteven planners of a scheme to build a community centre, a convenience store and four retail units with office space above on the edge of a new housing development in Sleaford. 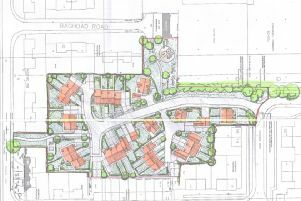 The plans, including a 64-space car park, by Grantham Estates, would sit at the entrance to the 1,450-home Sleaford South Sustainable Urban Extension known as Handley Chase off London Road. As well as housing, the overall project has outline permission for a two form entry primary school, care home, health centre, nursery, public house, public open space, sports pitches and allotments. There have been several comments so far, with Ian Paterson of nearby Deira Close suggesting the shops should be further into the new estate rather than imposing light and disturbance on existing neighbours. Neighbour Peter Roberts pointed out it ignored a copse of trees with a preservation order on them. Other bodies wanted more details on drainage and lighting.